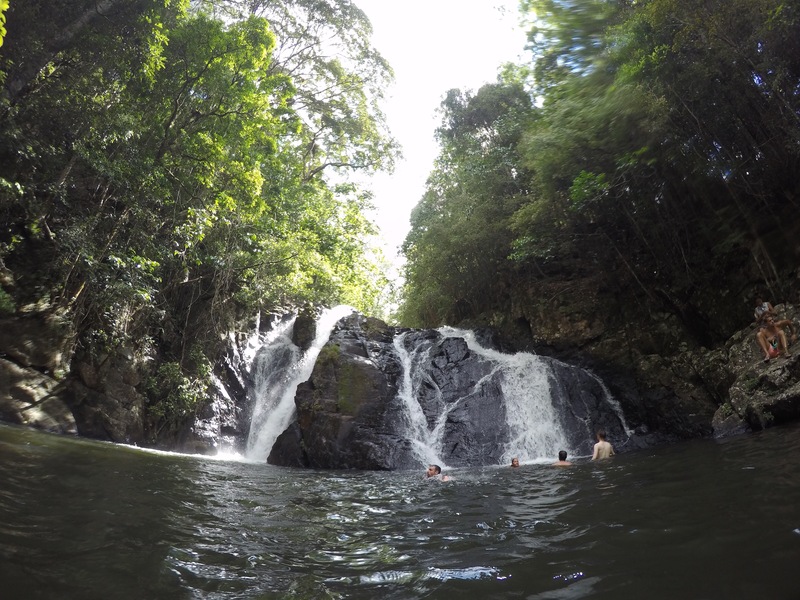 On the 14th March 2017 we went on the Waterfall Wanderers tour from Cairns to see some of the many waterfalls in the area. Our tour guide was called Jim and there were two buses from the company out on tour that day so there was a lot of people about! 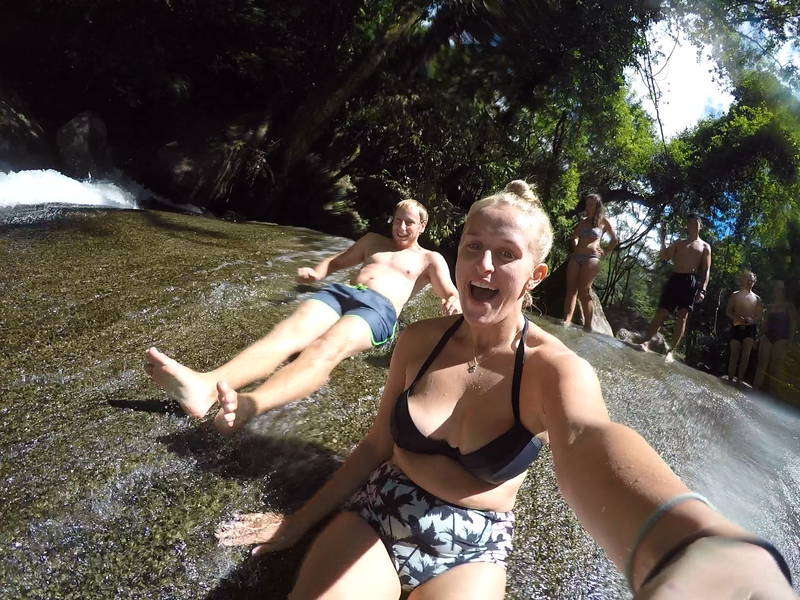 We found our tour guide a bit much to handle so early in the morning – he was making some very cheesy jokes – but after our morning tea at a place call Babinda Boulders, it got funnier. 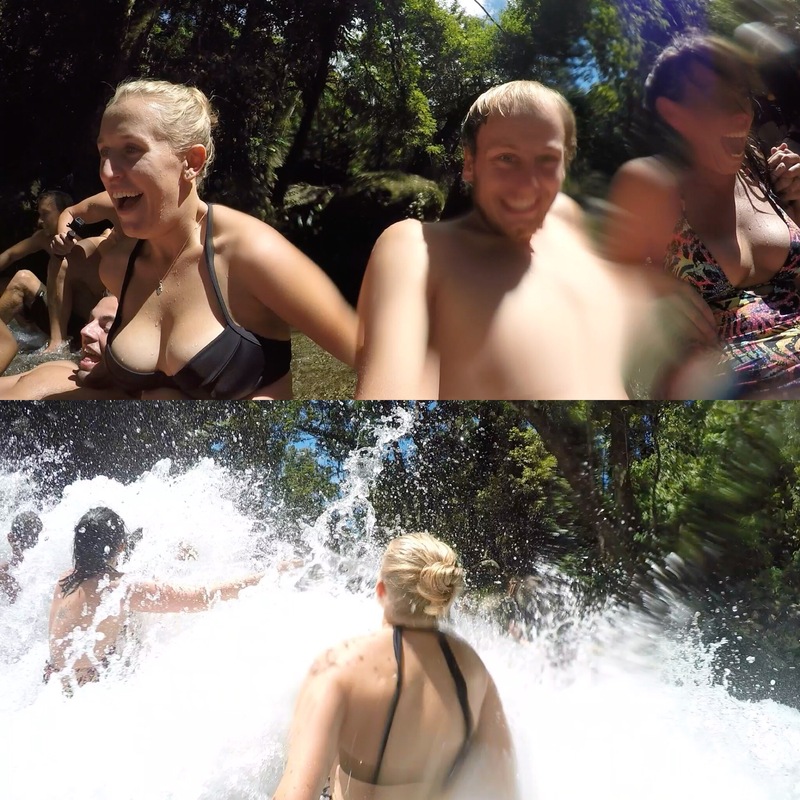 Our first official stop of the day was to Josephine Falls which is essentially a giant rock slide. All the rock is really smooth and the water runs quite fast down it so you pick up quite a bit of speed. 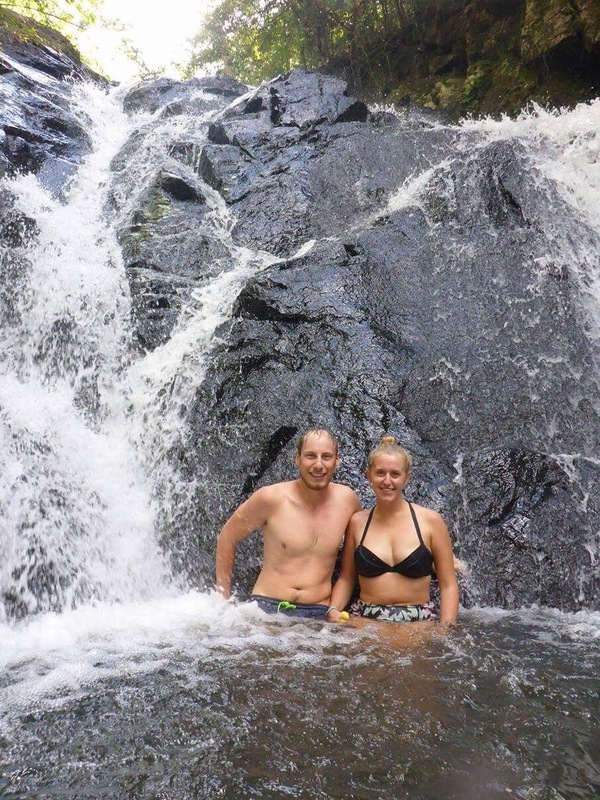 When we first got into the pools we were instantly swept off the rocks by the current from the falls. Luckily, the area is naturally sectioned off by boulders so the current only takes you around the pool. It’s also super slippy to get out on to the top of the rock slide so it is an effort to get to the top. The only way to describe what it’s like to get out is penguins jumping out of the water onto the ice and sliding along on their belly’s – we have to swim and slide up onto the rock until we’re far enough up to get a grip and pull ourselves to our feet. 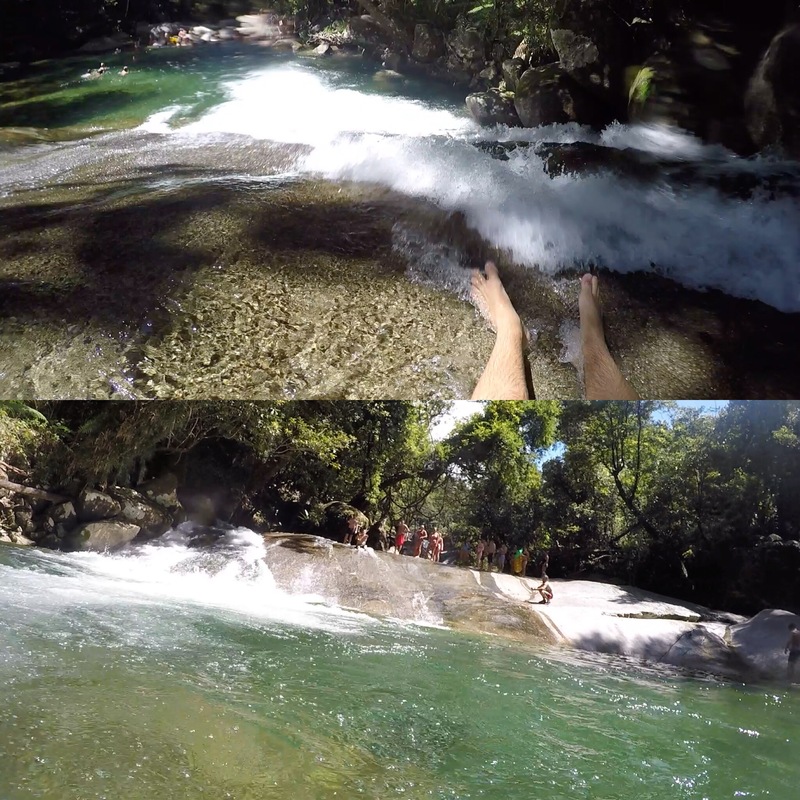 You then walk along the top of the Falls to the end where there is the fastest water and then slide down the rocks. 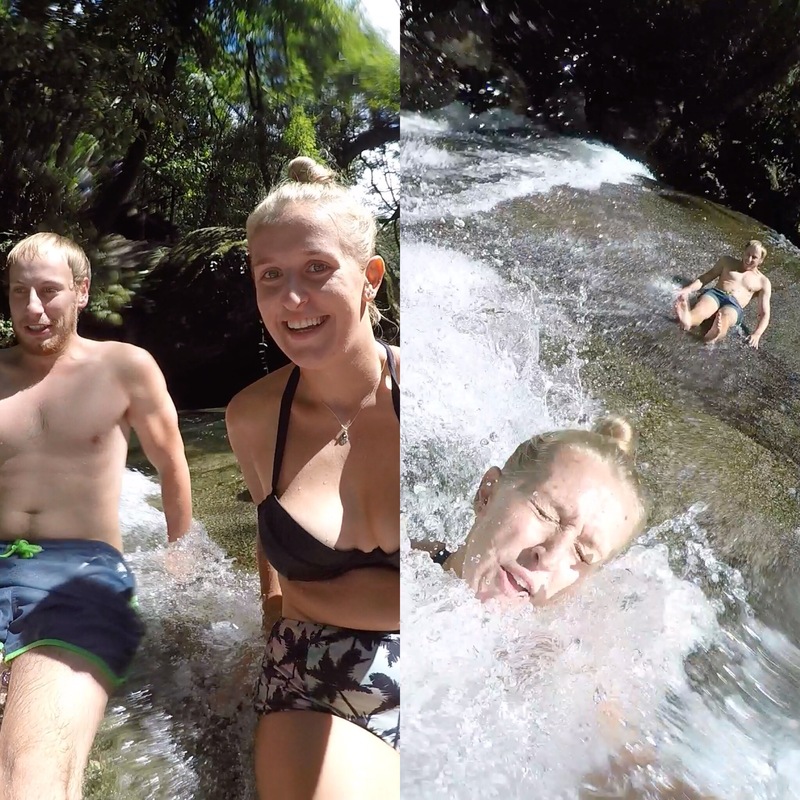 You go really fast down the Falls and it’s quite a big splash at the bottom. 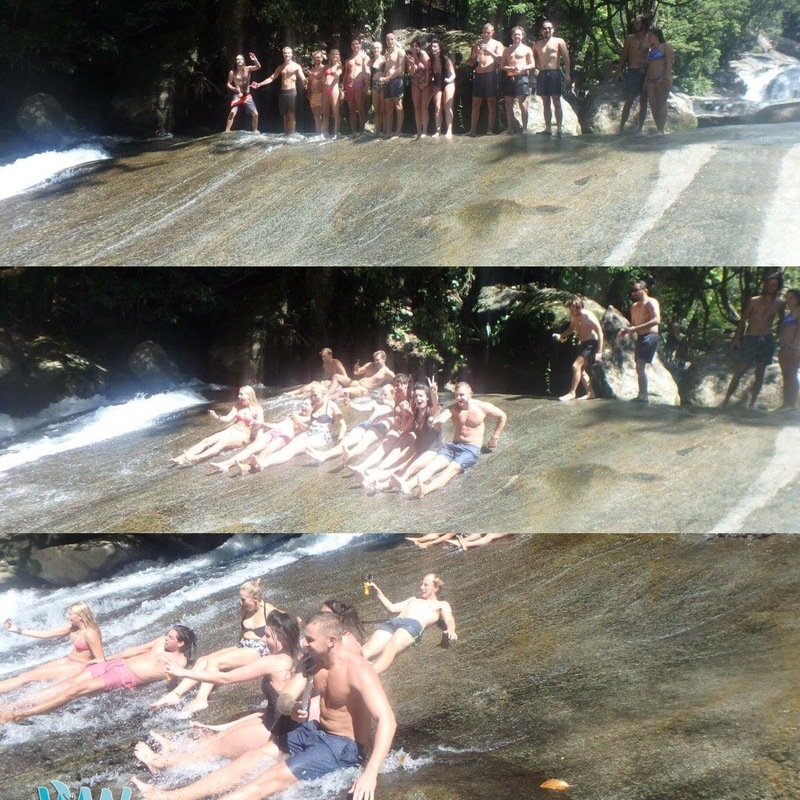 We often went down in big groups because of how wide the Falls are – it’s really fun! 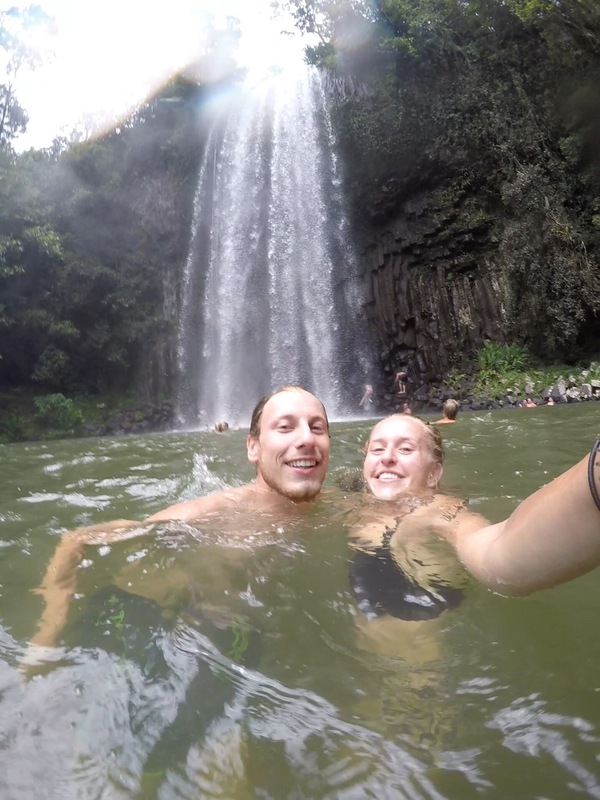 Our guide also had a camera to get pictures of us going down the waterfall which was nice. Everyone on our tour obviously tired themselves out having fun on the slide because over half the bus was asleep on the way to the next site! 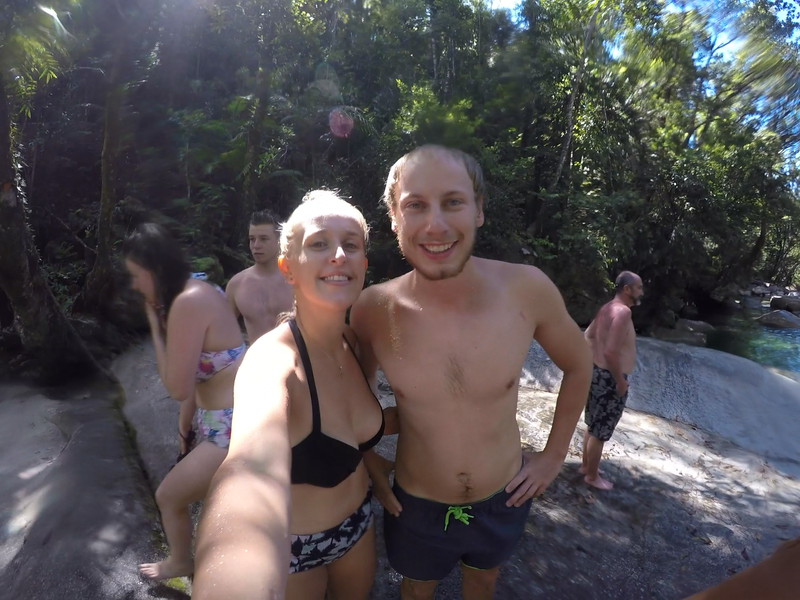 Our next stop took us over the mountains to Millaa Millaa Falls. 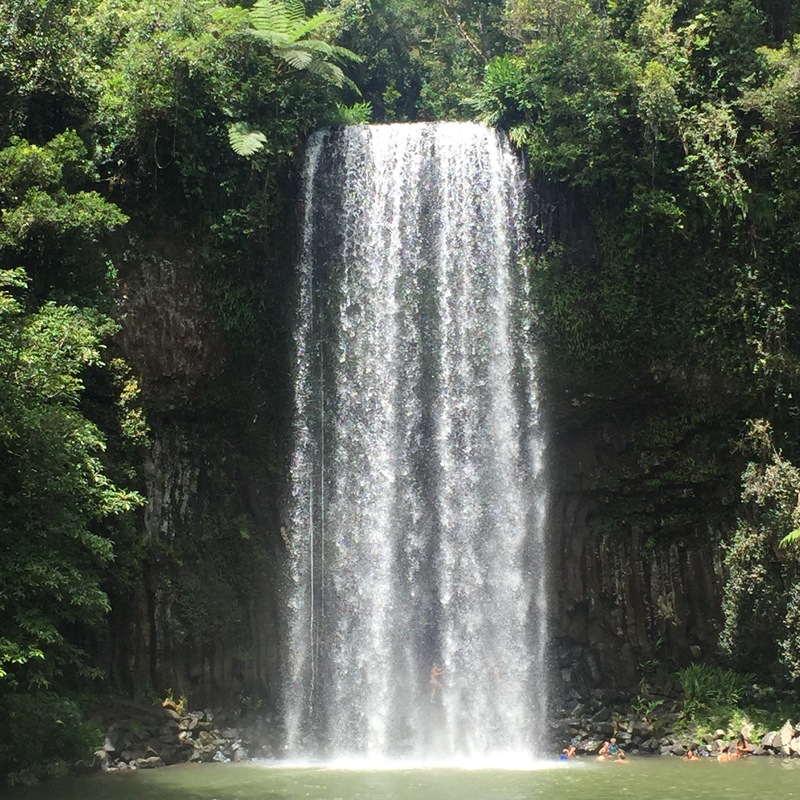 This is the waterfall that is used in the Peter Andre music video for Mysterious Girl as well as being the hair flick scene for the Herbal Essences advert. 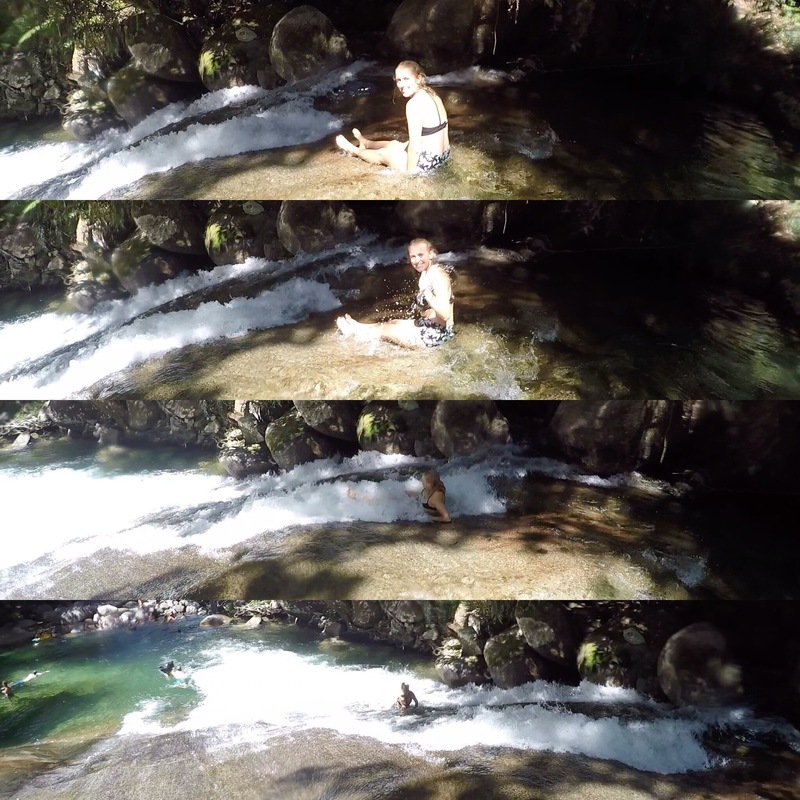 It’s a really nice waterfall with a pool surrounding it. 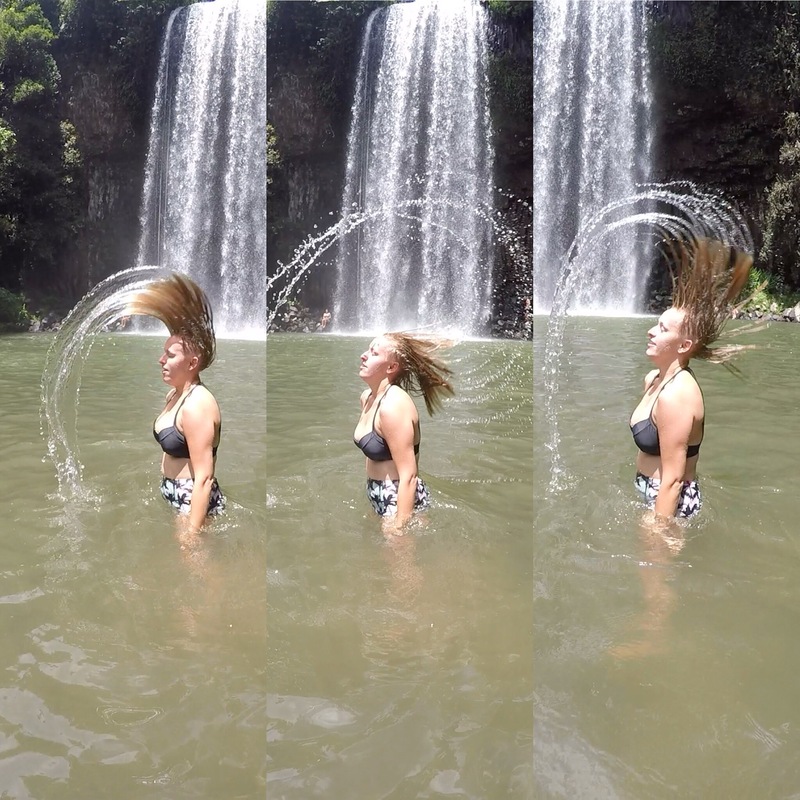 Of course we did the famous hair flick and also did one as a group with the rest of our tour. 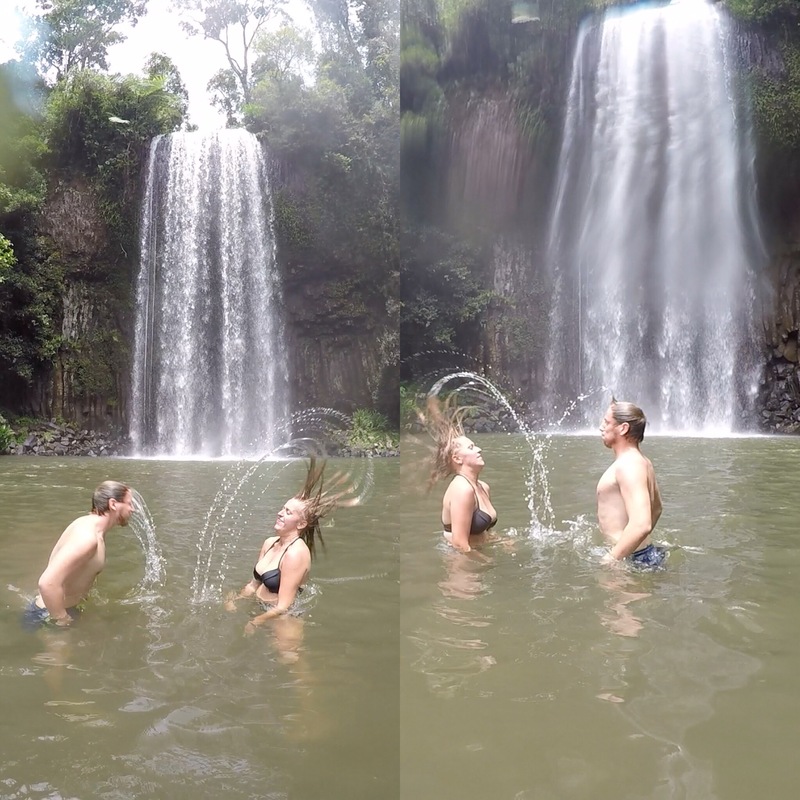 We also went around the back of the waterfalls which was quite hard because it was so slippy and then we swam through the waterfall to the front – the waterfall was so powerful that I did not do that gracefully! We carried on travelling 1000m (3000ft) above sea level into the volcanic craters to Mount High Pipimi. 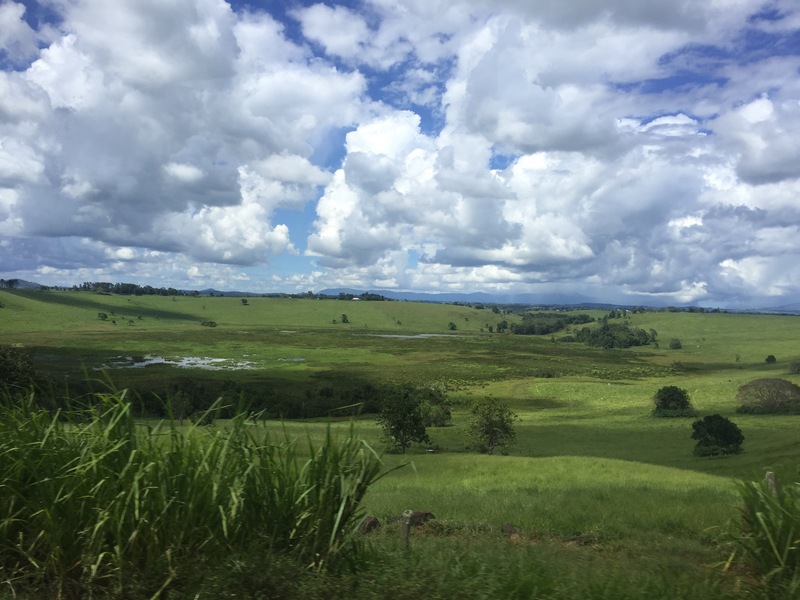 We drove around the Brookfield Crater/Swamp which is part of the tablelands and there is what’s known as the ‘7 sisters’ which are all very old volcanoes that now look like very round hills all dotted through the area. We stopped off at the Diatram which is a crater that is 58m down to the water and then 80m under the water to the bottom of the hole. This was caused by some lava from the volcano hitting a pocket of water which caused a massive steam blast that took a chunk out of the mountain. 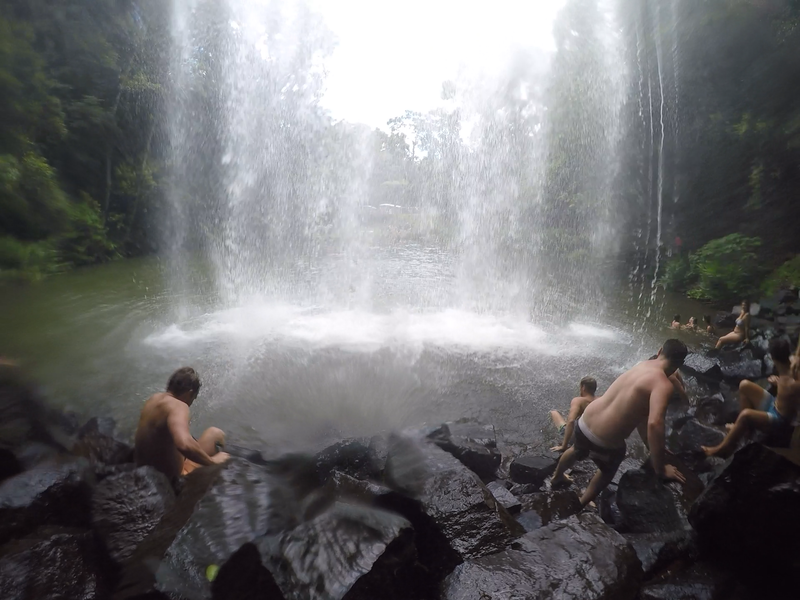 After a burger lunch in a pub we headed to Dinner Falls which was the last falls of the day. 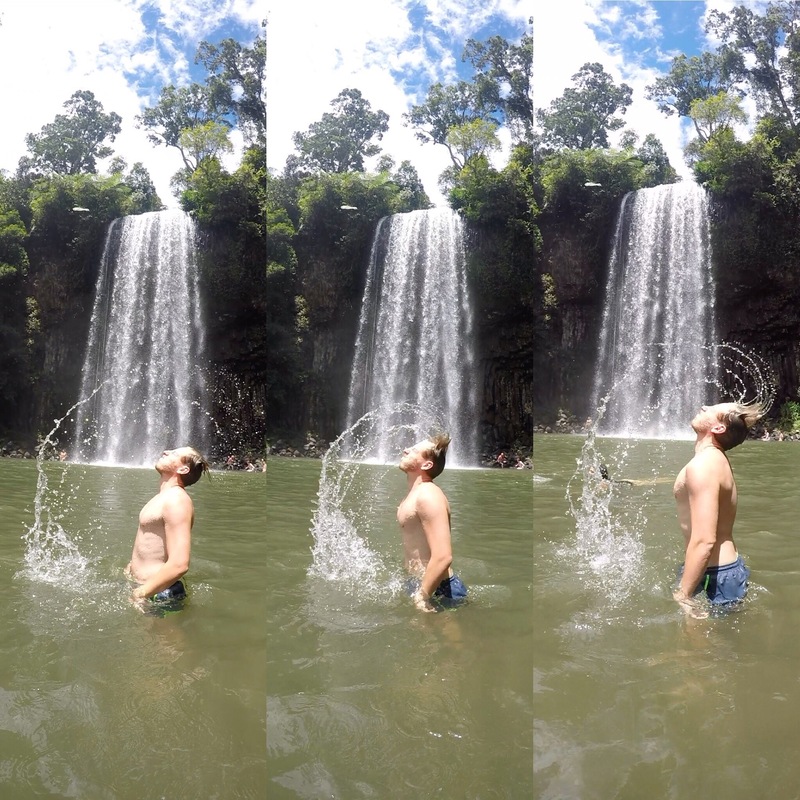 It wasn’t as big as the Millaa Millaa Falls but was really nice to swim in. The water was freezing though so you had to really brace yourself before going in – I don’t know if that was because it was a bit more shaded or because we had dried ourselves from having lunch. 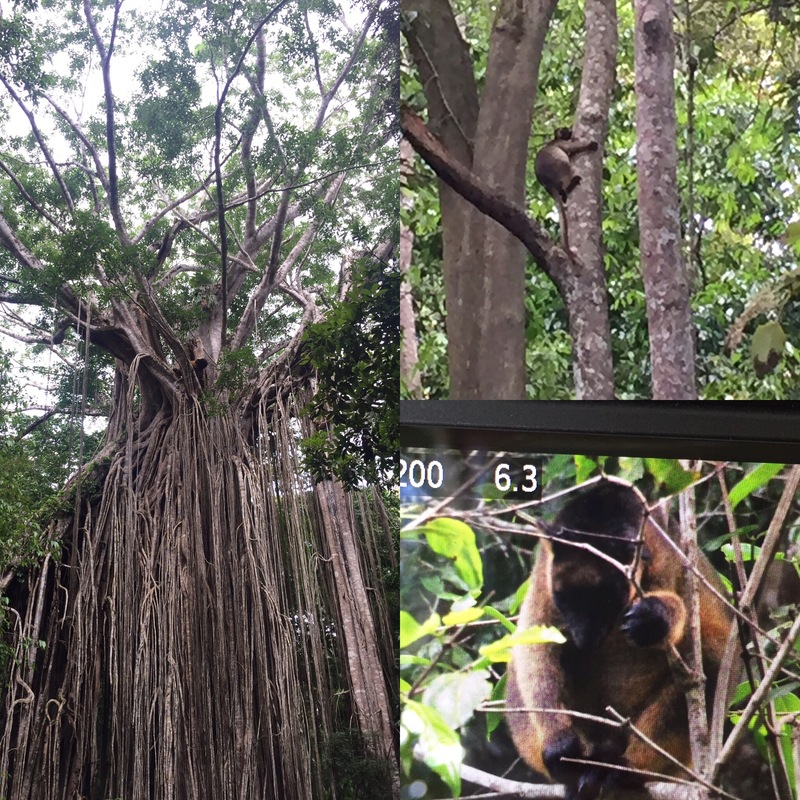 On our way back up to the bus we saw a tree kangaroo. It looks very similar to a kangaroo but with arms that are a lot like a lemurs and is really hard to spot in the dark forest trees. On the way to the next stop, our driver played ‘guess the soundtrack’ which was good fun – me and Niall were able to guess nearly all the film soundtracks they played! We then headed to the Curtain Fig Tree which is like the tree that they use in Avatar. The tree is absolutely enormous and very old and was surrounded by a lot of other very tall trees. This is where we got a better look at another tree kangaroo that was sitting out in the open compared to behind the branches of a tree like the last one we saw. We covered loads of stops on our tour, some that were better than others. One less exciting stop was to a platypus spotting station. This is because you are never going to see one when there are around 40 people all trying to look at once. You have to be really quiet to have even the slightest chance to see one so we really didn’t hold our breath. We did, however, see a turtle and a little possum which was cool to see – the possum was tiny and very fluffy! 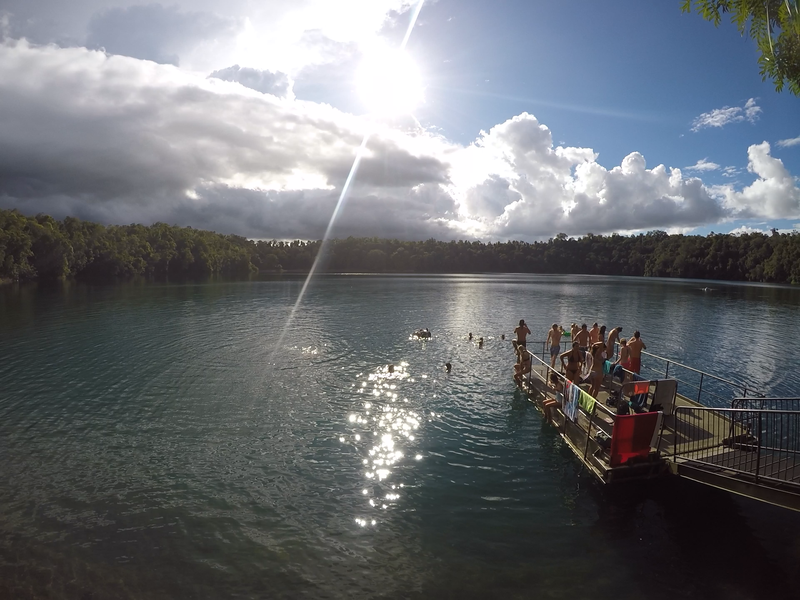 Our final stop of the day was to Lake Eacham. This is a crater lake and goes to a depth of 65m – our guide had done altitude diving at the bottom here and said it was freezing cold. Before we went swimming there was a more shallow section of water that you could view from a platform that had loads of turtles living there! The water was a brilliant bright bluey green in this section which was surprising because it wasn’t that colour in the rest of the lake (likely because of the depth). 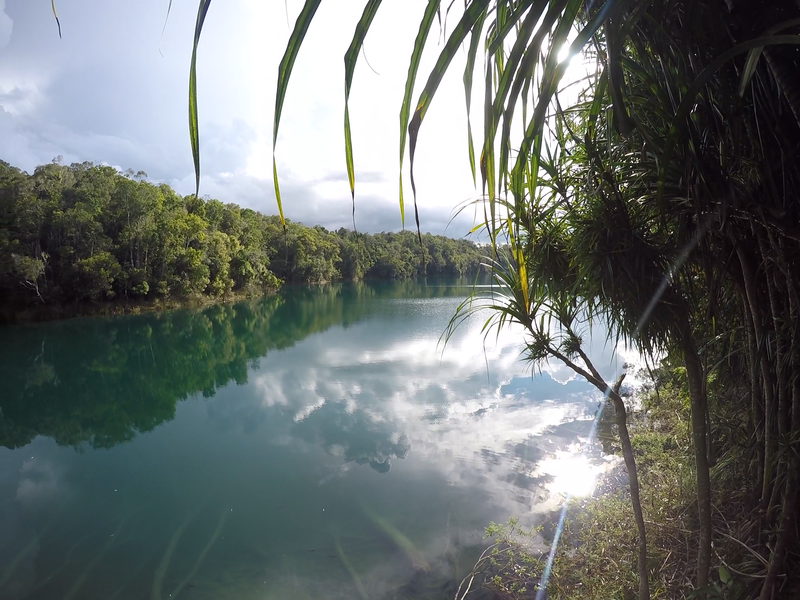 The lake actually has a fresh water crocodile living in it but they aren’t aggressive and don’t hunt humans so we weren’t worried about going swimming! 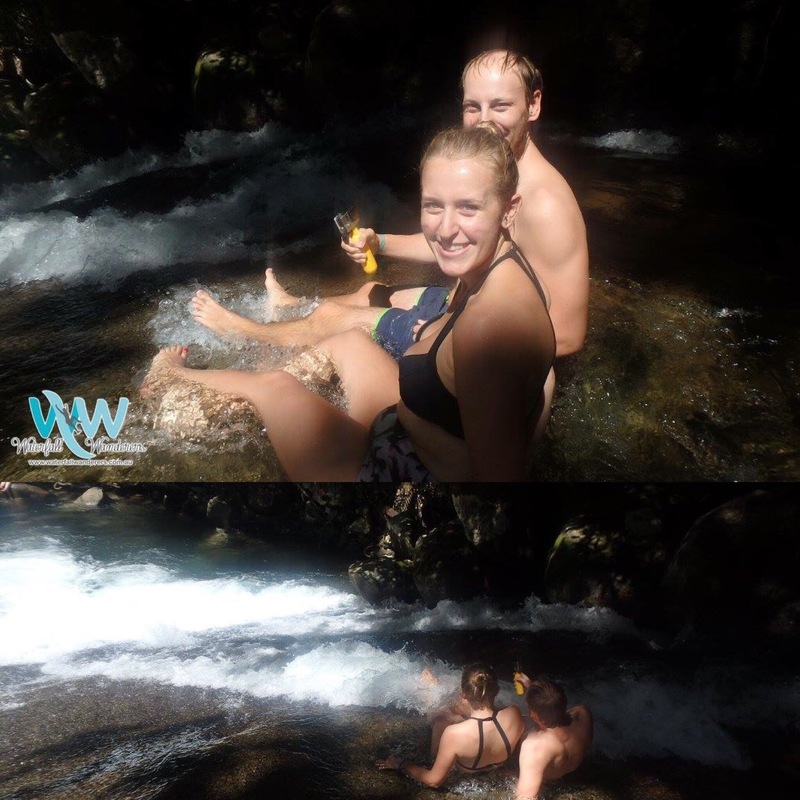 The water was actually the warmest of all the water we had been in that day and we were in there for quite a while before treading water became too tiring for us. We ended the day with some afternoon tea before heading back to Cairns. 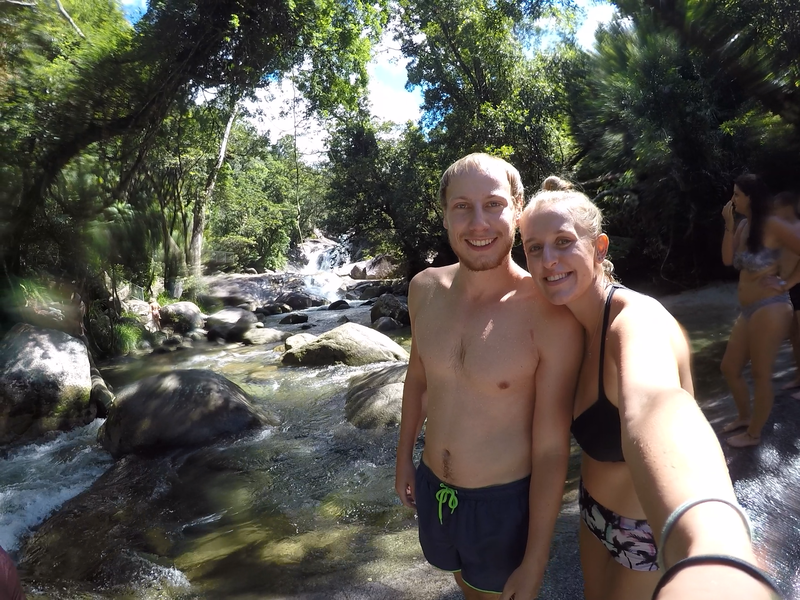 It was a few hours back to Cairns and we took the Gillies Highway which has 226 bends which drop you back down the 1000m to Cairns and to sea level. 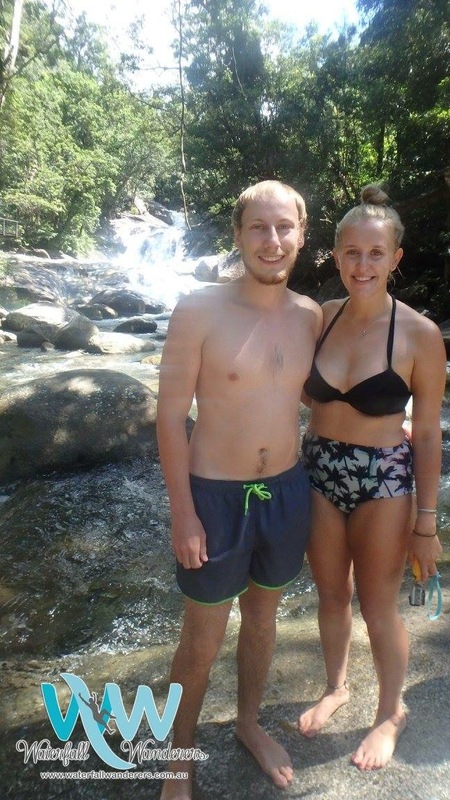 It was a good day touring the area and we ended getting to do and see a lot so we’re really glad we did it whilst we were in Cairns. That evening we ended our night, as we did so many nights, in Gilligan’s and ran into two of the lads we had spent the tour with, Ben and Jack which was nice. One of the really lovely things about travelling is that you meet so many people and become friends, even if its just for a day. 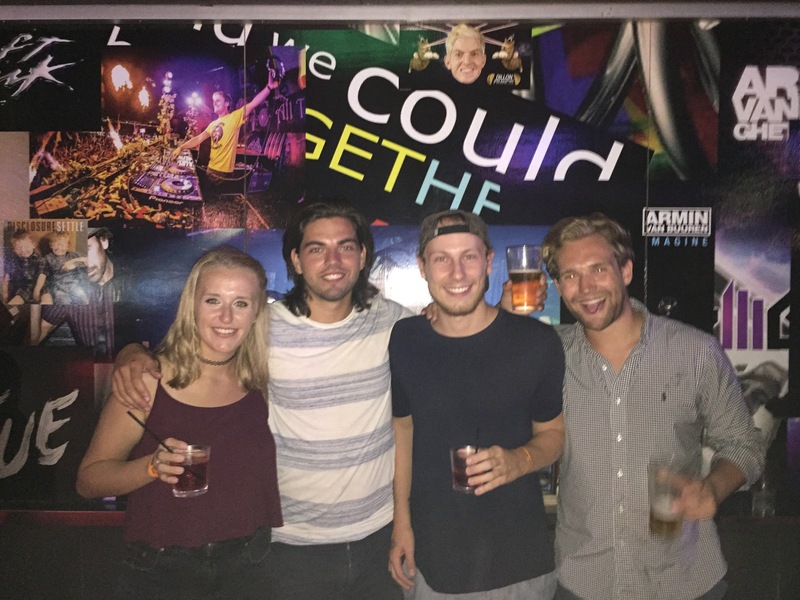 You also get to pass on travel tips of fun places to visit or get some tips from them which can open your eyes to new places you may never have considered visiting!